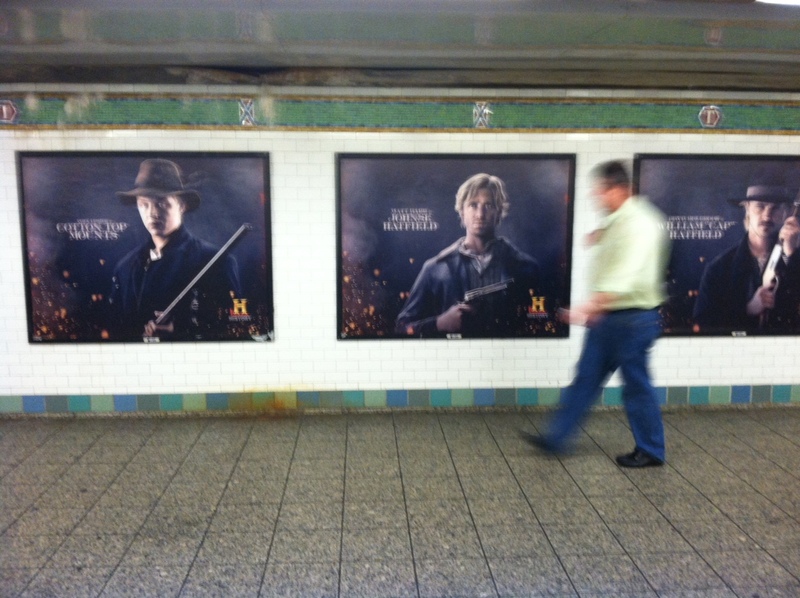 The History Channel’s Hatfields & McCoys promotion is in full swing in NYC! 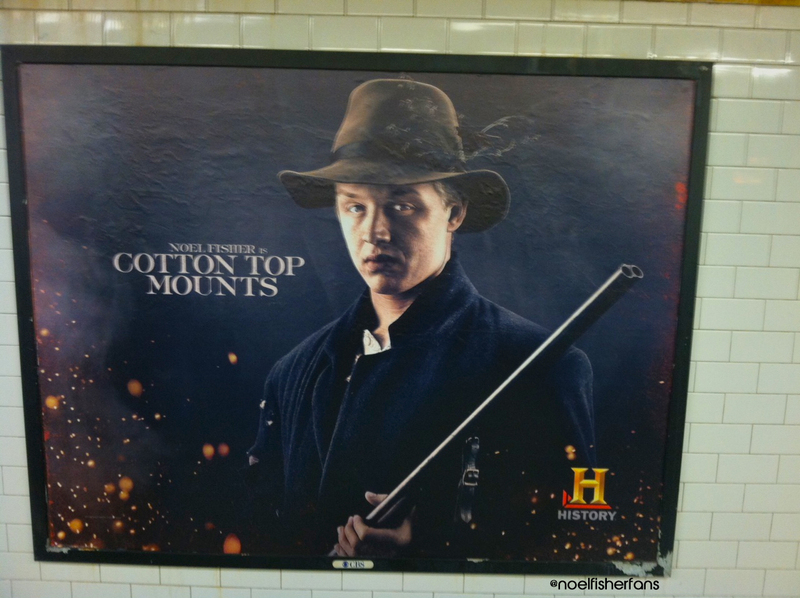 We wanted to share the billboards we saw today in the Times Square subway. Hopefully we can get this in HQ soon. It’s the true American story of a legendary family feud – one that spanned decades and nearly launched a war between Kentucky and West Virginia. 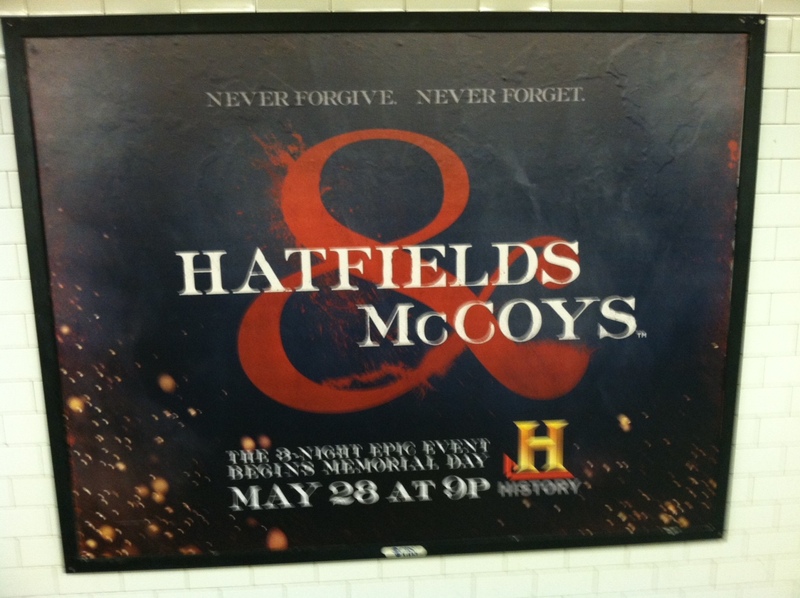 HATFIELDS & McCOYS, a new three-part, six-hour scripted miniseries, showcases an all-star cast led by Academy® Award winner Kevin Costner and Golden Globe® nominee Bill Paxton starring as Devil Anse Hatfield and Randall McCoy, respectively. 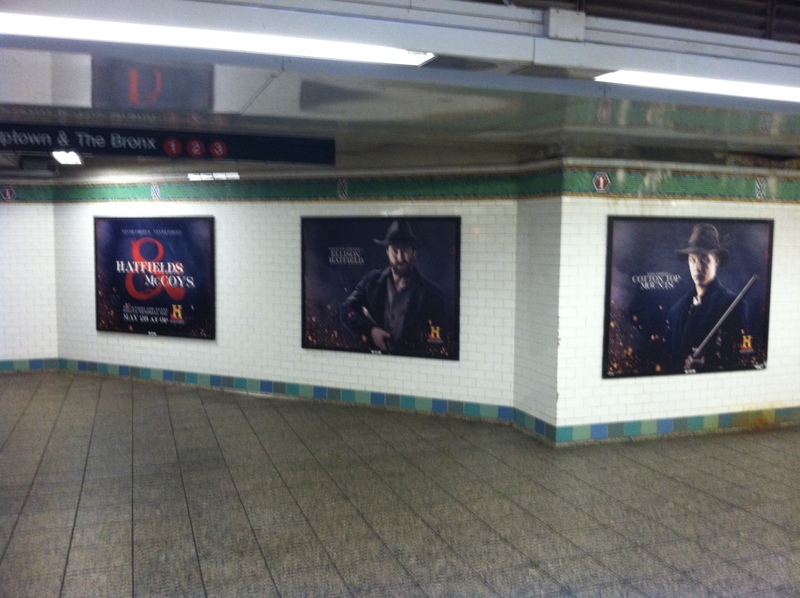 The mini series premieres on May 28, 29 and 30, at 9 p.m. on HISTORY®. HATFIELDS & McCOYS is the story of a clash of clans that evoked great passion, vengeance, courage, sacrifice, crimes and accusations, and includes a cast of characters that changed the families and the history of the region forever. The Hatfield-McCoy saga begins with Devil Anse Hatfield and Randall McCoy. Close friends and comrades until near the end of the Civil War, they return to their neighboring homes – Hatfield in West Virginia, McCoy just across the Tug River border in Kentucky – to increasing tensions, misunderstandings and resentments that soon explode into all-out warfare between the families. As hostilities grow, friends, neighbors and outside forces join the fight, bringing the two states to the brink of another Civil War. Joining Costner and Paxton are Golden Globe® winner Tom Berenger as Jim Vance, Devil Anse’s “Uncle Jim,” the firebrand warlord of the Hatfield family; Emmy® Award winner Powers Boothe as Wall Hatfield, Devil Anse’s level-headed, fair-minded older brother, who was the local (West Virginia) justice of the peace and judge; and Academy® Award-nominated, Emmy® Award-winning Mare Winningham as Sally McCoy, wife of Randall McCoy and the family matriarch who loses four sons, a daughter and her own sanity in the feud. When Devil Anse Hatfield wins a legal battle against Randall McCoy’s cousin Perry Cline in a dispute over timber rights, the tension quickly explodes. Randall’s brother Harmon, who served as a Union soldier, is the first casualty of the feud and Devil Anse’s uncle Jim Vance is said to be the killer. However, the tipping point of the feud is when Randall accuses Devil Anse’s cousin Floyd of stealing his pig. Despite the bad blood, Randall’s beautiful daughter Roseanna falls madly in love with Johnse Hatfield, Devil Anse Hatfield’s oldest son, and the consequences are disastrous. As retaliations grow, more and more family members are horrifically massacred. The feud makes international headlines. The governors of West Virginia and Kentucky clash, ultimately, the U.S. Supreme Court intervenes. 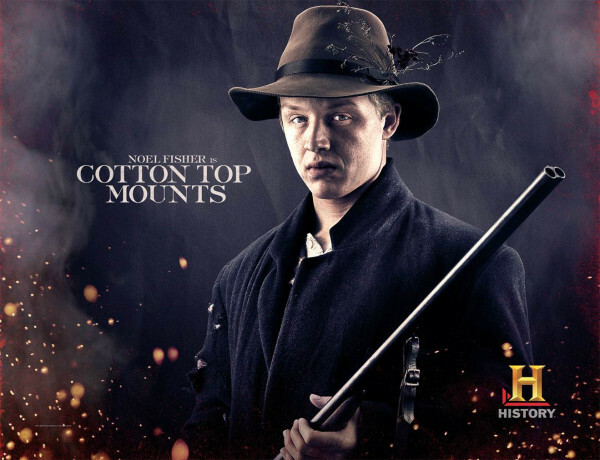 Rounding out the stellar cast include: Matt Barr as Devil Anse Hatfield’s oldest son Johnse Hatfield, who has an unquenchable appetite for romantic trouble; Noel Fisher as Cotton Top Mounts, an illegitimate son of a Hatfield; Boyd Holbrook as Devil Anse Hatfield’s son, Cap, with a cloudy eye but best rifle shot of the family; Andrew Howard as Bad Frank Phillips, a private detective/killer for hire; Jena Malone as the ruthless Nancy McCoy; Sarah Parish, as Levicy Hatfield, the strong-willed wife of Devil Anse; Lindsay Pulsipher as Roseanna McCoy, the daughter of Randall and Sally McCoy; and Ronan Vibert as Perry Cline, the McCoys’ politically savvy attorney.